Who invented Hockey? Field Hockey: Historians tend to agree that field Hockey was invented in c. 2700 and the first known use of Hockey was during the Ancient Egyptian Early Dynastic Period of invention (3100 - 2686 BCE) and the Mesoamericans, Romans and Ancient Greeks also played a similar field game. Who invented Hockey? Ice Hockey: The game of ice hockey developed much later. Its origins were in Canada when James Creighton organized the first indoor ice hockey game at Montreal's Victoria Skating Rink on March 3, 1875. Ice hockey is now the official national winter sport of Canada and James Creighton is considered the "father of ice hockey". Definition of Hockey: Field Hockey is defined as a team game played on on a field by two opposing teams of eleven players each who use curved sticks to drive a small, hard ball into the opponents net. The game can be played on a grass field, a turf field or an indoor rink. Ice Hockey is defined as a fast contact sport played by two opposing teams of six skaters on an indoor ice rink who use a curved stick to knock a small rubber disc, called a puck, into the opposing goal. A similar game is also played on roller skates is played on an indoor board surface. Who invented Hockey? This article provides fascinating facts and interesting information about the history, evolution and invention of field and ice hockey through the ages. Did you know that the game was first played by Ancient Egyptians, that the first rubber balls and items of protective clothing were invented by the Olmecs Mexico and Guatemala and that Native American tribes used bone skates to play Shinny, one of the forerunners of ice hockey? Fact 1: Who invented Hockey? The origin of the word 'hockey' is possibly derived from the Old French word "hoquet" meaning "shepherd's staff or crook". This seems to be a reasonable assumption because the hooked sticks with which the game is played resemble shepherds' staves. Fact 2: Who invented Hockey? In North America, ice hockey is distinguished from field hockey, but hockey alone can mean either. Fact 3: Who invented Hockey? An alternative game played on roller skates developed in the late 1800's and the International Roller Sports Federation (FIRS), was established in 1924. Fact 4: Who invented Hockey? The game of hockey dates back to ancient times and began as a simple stick and ball game that evolved in many European countries. Fact 5: Who invented Hockey? The Ancient Egyptians were known to have played during the Early Dynastic Period (3100 - 2686 BCE). One of the earliest archaeological records of the field game have been found in the tombs at Beni Hasan, an ancient Egyptian burial site. One of the tomb paintings at Beni Hasan depict two men wielding curved sticks vying for the possession of a ball. Fact 6: Who invented Hockey? The ancient Ethiopian field game of Genna dates back to at least the first century AD in Africa. The Genna Players use carved wooden sticks to strike a wooden ball in an effort to pass it through the opponents’ goal at the end of the pitch. It is believed that the Genna sticks were originally the crooks used by shepherds. Fact 7: Who invented Hockey? The Ancient Chinese played a game called "bu da qiu" during the Tang dynasty (618–907). Bu da qiu was played with two teams in which the players struck pellets with wooden sticks which were crooked in the end. The winner was judged according to the number of pellets in the opponent’s goal. Fact 8: Who invented Hockey? The ancient Mongolian game of 'Beikou', developed from Bu da qiu, was played by the Daur people, an ethnic group from Inner Mongolia. Beikou, or Daur hockey is played with curved sticks or branches called the tarikebei and balls, called pulie. Fact 9: Who invented Hockey? Ancient Greeks also had their own version of the field hockey game that is depicted in a marble relief dated c. 510 BC that is displayed at the Archaeological Museum of Athens. The ancient Greek name for the game was 'Keretizein' and was first played with long cow horns. Fact 10: Who invented Hockey? The Ancient Romans played a game of hockey called 'Paganica', in which a small ball filled with feathers that was batted about with a curved club. Fact 11: Who invented Hockey? The Olmecs, the oldest of the ancient Mesoamerican civilizations played a hockey-like game. Dating back to 1500BC they were known to use ball courts and play with rubber balls. The Olmec combined the sap of the lowland rubber trees with the juice of the Morning Glory to create heavy, pliable, rubber balls. Because of the speed of play and the weight of the ball deaths were known to occur, subsequently players use protective clothing to avoid serious injuries to the hips, hands and the elbows. Primitive face masks were also used to protect the face. Fact 12: Who invented Hockey? The ancient, sacred Mesoamerican game similar to hockey called 'Pelota Purepecha' was played by the Aztecs (called 'tlachtli') and Mayans (called 'pok-ta-pok') to symbolize a battle between the sun and the moon, with the Pelota Purepecha players representing movement of the stars and universe. The game of Pelota Purepecha was played with with a hockey-like stick, carved from cherry wood or Mexican hawthorn, called the jatsiraku and ball called the zapandukua. Fact 13: Who invented Hockey? The Toltecs, the Incas and the Araucano Indians of Chile played a hockey-like field game called 'Cheuca', meaning "twisted one" in reference to the stick they used with a twisted end together with used a stuffed leather ball. Such games were used as physical training for warfare and also for high stakes gambling. Fact 14: Who invented Hockey? A type of field hockey known as 'Shinny' was among the most popular Native American games and enjoyed by numerous tribes including the Sauk and Fox tribes, the Assiniboine and the Crow. Team games and contests played a significant role in the lives of American Indians and many tribes had large playing fields in close proximity to their villages. Team members applied white or black paint to distinguish the sides especially when playing against neighboring villages. Fact 15: Who invented Hockey? In North American regions cold enough to have snow and ice in the winter American Indian tribes, such as the Sioux, played 'Shinny' on ice. Shinny was particularly popular with Woodland Indian Tribes of the Great Lakes area and lower Canada, such as the Iroquois, Huron and Abenaki, played shinny on ice with carved bone skates. These Native American Indians played shinny on ice with carved Bone skates were originally developed for hunting and traveling across lakes and rivers, and then the bone skates were used to play Shinny, the forerunner of ice hockey. Fact 16: Who invented Hockey? The word "Shinny" is actually an English word used to describe primitive form of Gaelic hockey, that was used by early explorers of the Americas when writing into their reports. The word "Shinny" is commonly called "Shinty" in Scotland. Fact 17: Who invented Hockey? The game of "Shinty" played in Scotland is older than the recorded history of Scotland and is thought to predate Christianity. The Shinty ball, consisted of a cork core covered by two pieces of leather stitched together and the stick, made from a piece of wood with a hook in it, was called a 'caman'. A similar hockey-like game known as "Cammag" was played on the Isle of Man. Fact 18: Who invented Hockey? The Irish sport resembling hockey known as 'Hurling' dates back to antiquity and was first recorded in 1520. Hurling was popular with other Celtic tribes including those who lived in Cornwall, England. The balls used for Hurling were called sliotars and were made from a vast variety of materials including wood, leather, rope and animal hair and even hollow bronze. The long, flattened, curved end stick used in Hurling was called the 'hurley'. Fact 19: Who invented Hockey? In 1873 James Creighton (June 12, 1850 – June 27, 1930) devised the informal rules for a new winter game in Montreal which would later became known as ice hockey. James Creighton was a figure skating judge who organised a new team game to played on the indoor Victoria Skating Rink located in Montreal, Quebec, Canada. 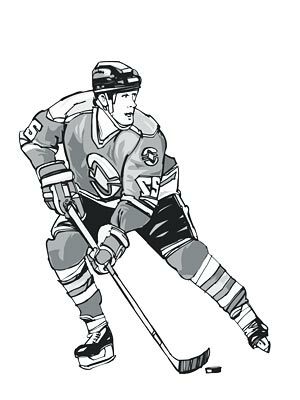 Fact 20: Who invented Hockey? Modern Field hockey was played in English public schools in the early 19th century and the British Army spread the game throughout the British Empire.